The value of social media marketing spans far and wide. Businesses that are international, local, large, and small, have realized the benefit to their bottom line. Doctors, Accountants, Lawyers, Trainers, and many other businesses and professions have also flocked to social media for branding power and growth. The single most powerful way to build your brand, and engage your target audience is through social media marketing. Companies and individuals want their name to be at top of mind when people think about them. Whether the reasons are for public relations or the bottom line, a good social media campaign is a lightning rod for success. In the past, having a flashy website and being on the first page of Google were the most important considerations in a marketing campaign. Today a site’s ability to engage visitors has taken precedence over appearance. 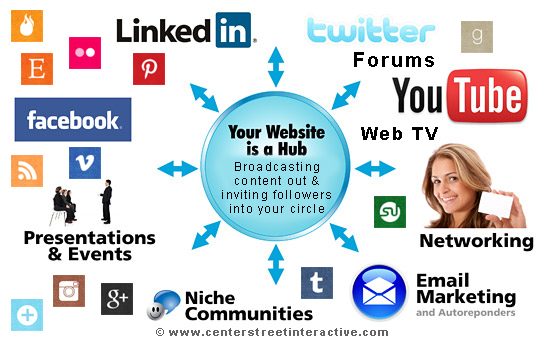 Content driven sites that are tied into social accounts have become very effective. The old method of marketing and gaining customers online was to build a flashy website, drive visitors to it, and make your pitch. It was like having a grandstanding salesman preach to a silent audience. There was little or no engagement. It worked if you had a hot product and good search rankings, but the explosion of social media has offered more ways to accomplish the same goal. Today’s approach is more personal than ever; even for the biggest brands and companies. It involves inviting people to your website, and inviting them to follow all of the corresponding social networks through which you can make a more personal, and romanticized pitch. During this process you create a captive audience that you can interact with indefinitely. These are people that have specifically expressed interest in you, or your product or service and will recommend it to friends and family. Experts have referred to Facebook as “the new internet”. It’s ability to reach and influence people when combined with other social media accounts is unmatched. Word of mouth referrals have always been a statistically superior way of gaining new customers. Social Media Marketing is like word of mouth on fire. You create meaningful content on your website and disperse it through numerous different mediums ranging from forums, to video sites, professional sites, social accounts, and more. During this socialization process, people interested in what you have to offer are invited to join your group of followers. You are then able to reach out to this group with future updates, and promotions. Keep the content relevant and interesting, and you’ll keep your following. As you build your audience, followers will tell their friends and family about you just as they would in the real world. The difference is that when they post an update about you on their social network it will not only reach the intended person, but will also reach that person’s friends, family, business associates, friends of friends, friends of family, and their business contacts. This results in an exponential increase in the amount of people that are reached and informed about your brand, product, or service. While all of this is happening you are simultaneously improving your ranking in web searches. Google and other search engines have started indexing the social networks, and that trend is expected to continue. At the end of the day, traditional marketing pales in comparison to what the digital world has to offer. Would you rather run a TV, Radio, or Print advertisement that costs hundreds if not thousands of dollars and is gone after it runs? Or would you like an advertising opportunity that grows daily and pays dividends long after the initial message is delivered? Companies, Brands, Celebrities, Realtorss, Doctors, Lawyers, Accountants, Politicians, are all realizing the value of Social Media Marketing.